Day 197 / Hat 197: Purple, gold and white striped cuffed knit hat with shag pom-pom in the same colors. Details include an embroidered Los Angeles Lakers logo on one side of the rolled up cuff, and a purple Adidas logo on the other. Interior tags read: "100% acrylic," "adidas.com," and one tag simply bears the NBA logo and the Los Angeles Lakers logo side by side. A cold-weather Lakers lid both a nod to the unusually cold L.A. weather (I actually had to scrape my car window this morning - the horror!) and the Lakers superstar point guard Kobe Bryant's return to the basketball court for the first time since tearing his left Achilles tendon back in mid-April. It wasn't exactly a triumphant return for Bryant, and the Lakers ended up losing to the Toronto Raptors, 106-94, but I'm confident that Bryant -- like the L.A. weather -- will be warming up to what we're used in no time at all. Oh, and since this cozy piece of headgear was pilfered from the Bride's hat-stash, she gets today's obligatory hat tip. 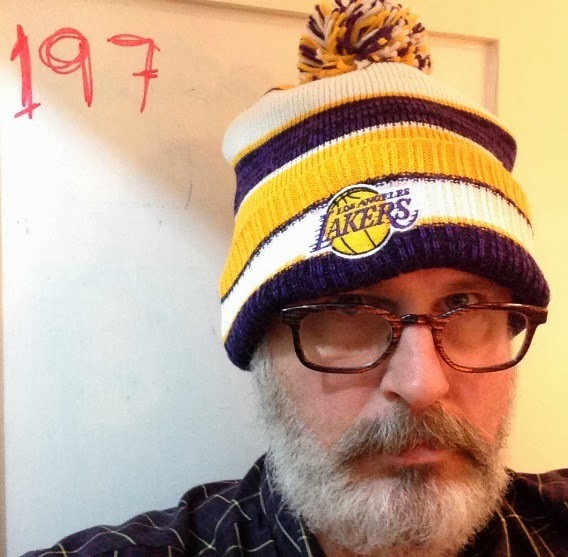 PC 157: Let's Go Lakers!